Workshop Description: "If you’re looking for a fun and easy way to introduce your customers to Making, sewable circuits are a great place to start. It’s possible to put together workshops for kids just old enough to hold a needle, all the way to designing complex, programmable garments such as a jacket with lighted turn signals for bicycle safety. This workshop will walk you through a circuit project as well as provide resources for developing your own programs." This presentation shares tips for incorporating easy to use, scalable, and fun activities for library programs for a workshop held at the 2014 Colorado Association of Libraries Conference. Topics include activity selection, workshop timing, budgets, and example projects. Participants also followed along with presenters to craft an e-textile art pin as the hands-on portion of the workshop. 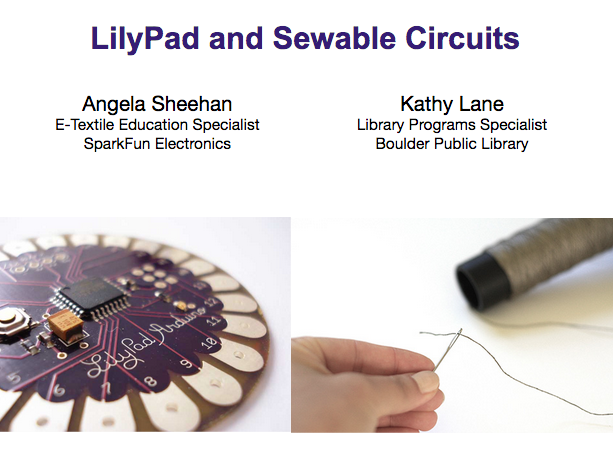 Materials developed and presented by Angela Sheehan of SparkFun and Kathy Lane of Boulder Public Library.